Did you know that over 50% of medical device companies still use manual, paper-based approaches for managing documents and records? It’s 2015 and manual, paper-based approaches to managing documents and records for your medical device company are fraught with issues and “gotchas”. You are trying to reduce risks, right? Throughout my career, I have been part of bringing 40+ medical devices to the market–class I, class II, and class III products. For all these projects I was either the product development engineer, the project manager, the quality manager, or regulatory resource. I have used paper-based approaches as well as other electronic document systems. And paper is by far the riskiest (and most expensive) way to manage medical device product development projects and quality systems. Have missing documents and records. Flat out. I promise. There will be critical must have documents you need as objective evidence which will be lost, never to be found. Documents and records will be out of sync. Managing document revisions in a paper world is an absolute nightmare. Making sure the correct revision is kept and maintained everywhere is a tall task. Must have review and approval signatures on documents will be missing. With paper, you need to have actual “wet” signatures on paper. I guarantee that not all documents will have all approval signatures when you use paper. And the worst part about all of these issues with using a paper-based approach is that you will not know it until the worst possible time: during an audit or inspection. 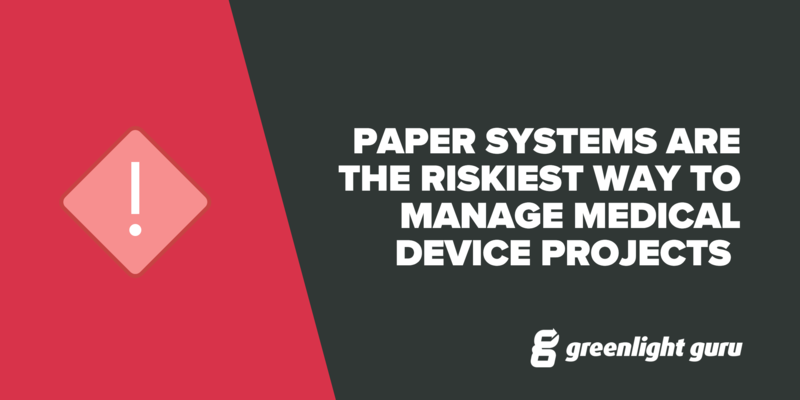 Paper is the RISKIEST compliance move you can make. Fortunately, you can easily remove this risk. You can implement a solution that allows you to better manage all the documents and records for your medical device company. A solution that is always up to date and audit ready. 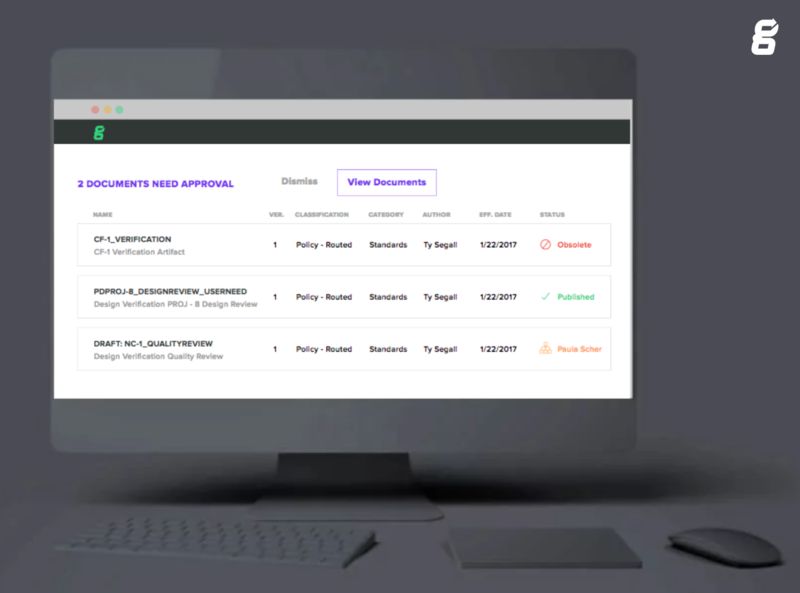 Greenlight Guru is specifically designed for your medical device company to ensure all documents and records are current, approved, and in a single location. Paper remains popular in 2015 for one reason: the perception is that using paper to manage your company’s QMS, documents, and records is easier than the other alternatives available to you. And for most solutions, you may be correct. The reason this software platform exists is simple: To provide your company with a single source of truth for storing and maintaining all documents and records. If you need to keep documents and records secure, while having proof of signatures and approvals with all revisions, then Greenlight Guru is a solution for you. Designed specifically for the needs of medical device companies to meet FDA regulations and ISO 13485 requirements for document control and records management, we’ve made the decision to finally eliminate paper-based approaches pretty easy. No more trying to track down which desk has your critical document buried in a random pile. Or worse yet, wondering if the VP took your record needing approval with him on his two-week business trip. Stop worrying about where each and every revision--current or past--is located or if you don’t have them. Greenlight Guru allows you to store every single revision of every single document and record. You will know what is the current published version. You will have the entire trail of past revisions too. Complete with approvals and training records. One of the biggest issues cited during FDA inspections and ISO audits time after time is that documents and records are missing approval signatures. Actually, in a paper world, it’s not all that surprising and unfortunately, all too common. You have to know that your documentation was reviewed and approved by the necessary roles and functions within your organization before being implemented. Greenlight Guru prevents you from publishing a document until it has been approved, with electronic signature records. You just don’t have this type of control with paper. I realize you make think that a FDA inspection or ISO audit may not happen to you. Or that you will be able to manage and play catch up before these types of events ever occur. FDA has a mandate to conduct onsite inspections of all medical device companies with a class II or higher products at least once every two years. And FDA does not have to tell you when they are coming. If you have an interest in selling products outside the U.S., chances are you are considering ISO 13485 certification. To do so, you willingly invite an outside audit team into your facility on an annual basis (and maybe more frequently). Suffice it to say that inspections and audits are part of doing business in the medical device industry. And inspectors and auditors have one thing in common: They will review your documents and records as objective evidence that your company is following the applicable regulatory requirements and your established procedures. Having a document management system in place that is always ready for inspections and audits is definitely a no-brainer best practice.